The dwarf galaxy NGC 4449 is the first dwarf galaxy with an identified stellar stream (faintly seen at the lower right, and in inset). 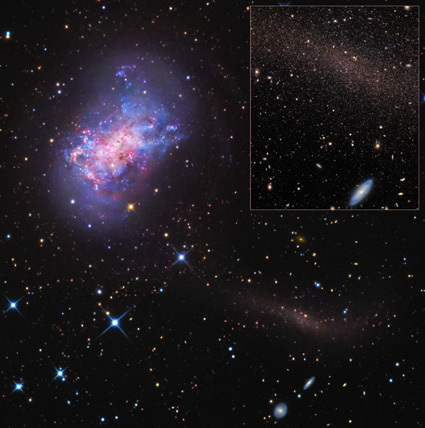 The star stream represents the remains of a smaller satellite galaxy merging with NGC 4449. The inset image shows the stream resolved into red giant stars. Image credit and copyright: R. Jay Gabany (Black Bird Obs. ); Insert credit: Subaru/Suprime-Cam (NAOJ). New images of a nearby dwarf galaxy have revealed a dense stream of stars in its outer regions, the remains of an even smaller companion galaxy in the process of merging with its host. The host galaxy, known as NGC 4449, is the smallest primary galaxy in which a stellar stream from an ongoing merger has been identified and studied in detail. "This is how galaxies grow. You can see the smaller galaxy coming in and getting shredded, eventually leaving its stars scattered through the halo of the host galaxy," said Aaron Romanowsky, a research astronomer at the University of California, Santa Cruz, and coauthor of a paper on the discovery that has been accepted for publication in Astrophysical Journal Letters and is available online at arxiv.org. The study was carried out by an international team of astronomers led by David Martínez-Delgado of the Max Planck Institute for Astronomy in Heidelberg. According to modern cosmological theory, large galaxies were built up from smaller progenitors through a hierarchical process of mergers. Astronomers can see many examples of mergers involving massive galaxies, but mergers of two dwarf galaxies have been hard to find. "We should see the same things at smaller scales, with small galaxies eating smaller ones and so on," Romanowsky said. "Now we have this beautiful image of a dwarf galaxy consuming a smaller dwarf." NGC 4449 is located 12.5 million light-years from Earth and is a member of a group of galaxies in the constellation Canes Venatici. In size and morphology, it is very similar to one of the Milky Way's satellite galaxies, the Large Magellanic Cloud. The stellar stream in NGC 4449 was first detected by another group of astronomers as a mysterious, faint smudge in digitized photographic plates from the Digitized Sky Survey project, and it is also visible in archival images from the Sloan Digital Sky Survey. But if it had been just a bit fainter, more diffuse, or farther from the host galaxy, it could easily have been missed. The authors of the new study called it a "stealth merger," where an infalling satellite galaxy is nearly undetectable by conventional means, yet has a substantial influence on its host galaxy. Martínez-Delgado organized a campaign to follow up on the initial report with more detailed observations. R. Jay GaBany, a Bay Area amateur astronomer and astrophotographer with whom Martínez-Delgado has frequently collaborated, obtained exceptionally deep, wide-field images of NGC 4449 with the half-meter Black Bird Observatory telescope (located in the Sierra Nevada mountains). Those images confirmed the presence of a faint substructure in the halo of the galaxy. Romanowsky, along with UCSC graduate student Jacob Arnold, then used the 8.2-meter Subaru Telescope in Hawaii to obtain high-resolution images in which the individual stars in the stellar stream can be seen. "I don't think I'd ever seen a picture of a galaxy merger where you can see the individual stars," Romanowsky said. "It's really an impressive image." The new observations support the idea that the stellar haloes around many dwarf galaxies are the remnants of smaller satellites that were shredded in past merger events. The ongoing merger in NGC 4449 may also be responsible for the intense burst of star formation seen in the galaxy. "This galaxy is famous for its starburst activity, and it seems we've found the reason for that. The gravitational interaction of the incoming galaxy has probably disturbed the gas in the main galaxy and caused it to start forming stars," Romanowsky said. The companion galaxy was also independently discovered by a team of scientists led by UCLA astronomer Michael Rich. Their study, based on images obtained by the Centurion 28-inch telescope located at the Polaris Observatory Association near Frazier Park, California, will be published in the February 9 issue of Nature. In addition to Martínez-Delgado, Romanowsky, GaBany, and Arnold, the coauthors of the Astrophysical Journal Letters paper include Jean Brodie, professor of astronomy and astrophysics at UC Santa Cruz; Francesca Annibali at the Astronomical Observatory of Bologna; Jurgen Fliri at the Observatory of Paris; Stefano Zibetti at the University of Copenhagen; Roeland van der Marel and Alessandra Aloisi at the Space Telescope Science Institute; Hans-Walter Rix and Andrea Maccio at the Max Planck Institute; Taylor Chonis at the University of Texas, Austin; Julio Carballo-Bello at the Canary Astrophysics Institute; J. Gallego-Laborda at Fosca Nit Observatory in Spain; and Michael Merrifield at the University of Nottingham, England. This research was supported by the National Science Foundation, NASA, and the UCSC-UARC Aligned Research Program.